Comments: Prior to 1972 US Marvel comics had been reprinted in the UK by a variety of licensees, including Alan Class and Odhams. In 1972 however, this reprinting was brought in-house with the formation of Marvel UK, whose first title was Mighty World of Marvel. In 1979, after a couple of title changes, usually as a result of absorbing other, failing Marvel UK titles, it became the monthly title Marvel Super-Heroes, which finally ended in May 1983 with #397. 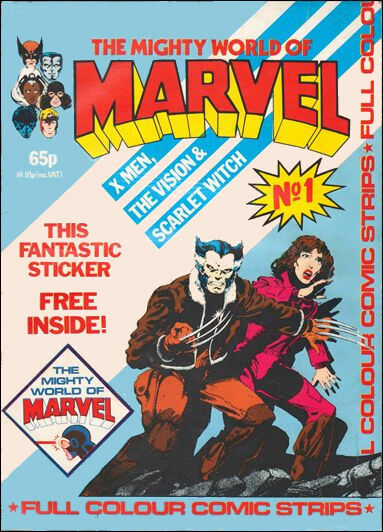 In July 1983 Mighty World of Marvel was revived as a full colour monthly, picking up Marvel Super-Heroes' final leading strip, the Claremont-Byrne era X-Men, where it had left off, at the start of the later-to-be-classic Days of Future Past story-line, alongside the US mini-series Vision and Scarlet Witch. With the latter concluding in #4, the fifth issue began reprinting Chris Claremont and Frank Miller's Wolverine mini-series. The seventh issue saw Mighty World of Marvel absorb The Daredevils, causing the X-Men's departure and bringing in Alan Moore and Alan Davis' Captain Britain and Night Raven (the latter text stories, rather than a comic strip), both of which had previously graced the pages of Marvel Super-Heroes. Falling sales saw the title drop some of the colour pages a few issues later, and in #13 Moore completed his run on Captain Britain, with Alan Davis and Steve Craddock taking over writing duties. Issue #16 saw the final instalment of Captain Britain before he departed to star in his own title. Though the next issue was the last, it saw the start of reprinting another US mini-series, Magik, which then transferred, along with the Night Raven text stories, to Marvel UK's Savage Sword of Conan monthly.